From the Bernard Matthews collection. It shows a number of ROD 2-8-0s dumped awaiting disposal after the Great War. Known places where they were dumped are Gretna, Birkenhead and Tattenham Corner. The one nearest the camera (not the one you can just see the chimney and smokebox of) is ROD No. 1714 and the one beyond it is ROD No. 1843. 1) where was the photo taken? 2) Is Bernard correct in stating that 1714 went to the LMS? No idea about either question, but all three wagons in the left background appear to be SE&CR. Now, after the war wagons could be seen all over the country, but three, all SE&CR suggests to me it is probably on their territory. A bit of speculation to expand on Mike's comments on SE&CR wagons,the nearest row of engines seems to be stabled in a platform road. A station that might fit this scenario was Tattenham Corner which was a 6 platform station with extensive sidings for empty stock and horseboxes. On a normal day no more than two platforms would be required.It would only be used to capacity on race days especially on Epsom Derby day. For most of the year there would be ample space for engine storage. Doesn't the station name board say ‘Tattenham Corner’? In the enlarged view it appears to be albeit a little indistinct. According to Brian Reed's Loco Profile 21: R.O.D. 2-8-0s (Profile Publications Ltd, February 1972) and the Stephenson Locomotive Society's Journal of 1927, R.O.D. No 1714 was sold to the LMS in March/April 1927, but was not given an LMS number and was dismantled in June 1927. It had been built by Nasmyth Wilson & Co Ltd (their No 1257) in 1918, one of 32 by them at a cost of around �8,000 each. As 75 of the R.O.D. 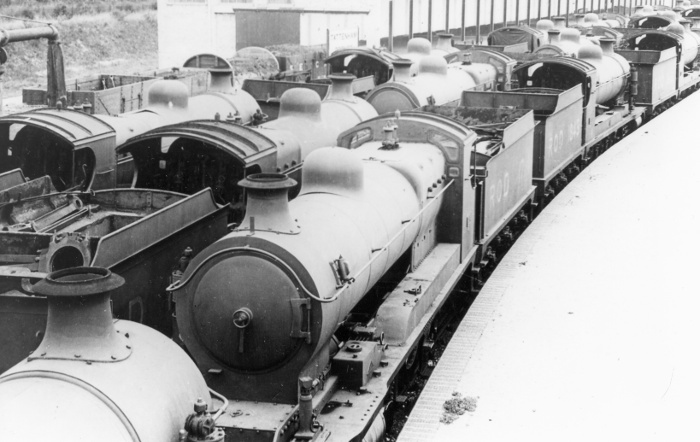 engines were sold by the Government to the LMS in 1927 for only �340 each, dismantling some of them for spare parts and scrap metal, while retaining the tenders for use on other classes, made a lot of sense - at least to the LMS, if not to the taxpayer.